This week’s post is by guest author Colin Bell, who is a Research Associate of the Faraday Institute and works on issues related to environmental sustainability. One of the most active areas of scientific research over the past twenty years has been the study of our planet’s environment. How is it changing? What has caused it? What can we expect to happen in the future, and what effect would changes in human behaviour have on it? Much of this study is focused on climate change, which has grown from a fairly obscure side-interest to a major field of study – but that’s only one of a number of ways in which we fear we may be damaging the planet we live on. Our planet and the variety of life on it form an immensely complex system with countless intricacies to discover and marvel at. Studying these things helps us to see planet Earth as something to be respected, wondered at and cared for rather than unthinkingly exploited. Similar sentiments come from most of the world’s religions. Despite radically different starting points and differences in detail, they all share broadly the same beliefs about the natural environment. The natural environment is given to us on trust, perhaps by a deity, and should be handed onto future generations in good condition. Our relationship with nature is important to us and an integral part of who we are. Although both the motivation for this project and its current conclusions are often depressing, it has presented scientists from many areas with a fascinating and challenging field of investigation. While the scientific picture is difficult enough to unravel, complexities are multiplied when we start asking the question, ‘What do we do about it?’ Formulating a solution to this question spills over into ethics, economics, history, sociology, politics, business, and other fields. Deciding what is right or fair involves numerous dilemmas, which one author describes as ‘a perfect moral storm’. Even what is obviously needed – substantial cuts in carbon emissions by the Global North – is strongly resisted. Various interest groups, individuals, businesses and governments all have roles to play in consuming and producing in a more environmentally friendly manner, but none are making changes at the rate that the scientists say we need to. There is some progress, but too often these different groups wait for each other to take action. Businesses ask government to legislate so that all are obliged to stick to standards, but government feels it needs greater support from the voters first, and so on. Religious groups have the potential to help unstick the process. Their fundamental beliefs often include care for the disadvantaged (the ones that will be affected most by environmental degradation), and a holistic worldview that all things are connected and should co-operate. These groups have a combined audience of millions. Unsurprisingly, many inside religious faiths are now beginning to see the possibilities for motivating their followers. Surprisingly, an increasing number of non-religious people are now seeing the influence that religion can have. 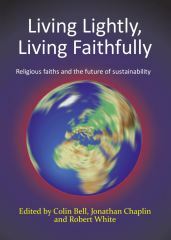 In September 2011, over a hundred people gathered in Cambridge to explore how religious groups can help encourage a more sustainable future for humanity, and the results of that conference have now appeared as a book, Living Lightly, Living Faithfully. The authors come from a wide variety of faith and practical backgrounds, but the book shows how we all have broadly the same goals and can work together, sharing our religious, scientific and practical expertise. Topics range from reforming economic practices to personal transformation, from principle to practice, as well as some more reflective chapters – sometimes it’s good to simply appreciate what we have been blessed with. So in sustainability and environment, scientific analysis and proposals can go hand in hand with religions’ pursuit of meaning, beauty and a better life. Though the situation facing us is challenging, we can retain hope and the motivation to look after our planet to the greatest extent still possible. For more details, go to the Sustainability in Crisis blog. Thank you for this post. You are right Henrique you says that unfortunatly “different groups wait for each other to take action”. Therefore, the question is how we, as individuals, can cut in Carbon emissions, in our daily life. I hope this book brings ideas for every christian.